There’s something so magical about a well-made dress. I found this ruffled Chloé number (budget-friendly option here) at Le Bon Marché in Paris back in May and had to have it. I knew it was special seeing as I never saw it in any of the online collections and hadn’t seen it at the boutique in NYC – it was only sold in Europe. 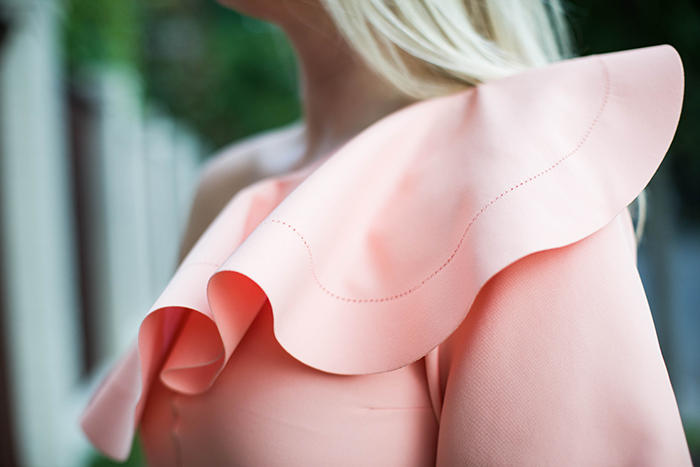 The fabric is strong and structured, but the ruffle adds feminine elegance – a timeless piece. Sometimes it’s worth dropping more dimes on a piece when you can tell the quality even at a glance. That’s how I felt about this dress. It’s not often I find pieces I want to (or able to) shell out the big bucks for, but when you find something like this you just go for it. I’d like to think of it as an investment. As I mature, I’ve realized it’s more important to have fewer, high-quality items, than a ton of mediocre products. These are the pieces that will stay in my wardrobe forever and will get re-worn over and over again. It’s hard to resist an inexpensive pick-me-up at a boutique, but the well-made pieces are the ones I adore for years and never want to get rid of. This dress is beautiful on you and the detailing at the seams is so unique. WOW – this dress is a stunner for sure…and the color suits your skin tone perfectly – reminds me of peaches & cream! That dress is beautiful to say the least. The color compliments your skin and hair color so well and I adore that ruffle! so girly and fun!! love it merritt! Love the color and the ruffle detail! I love this! The third picture is simple adorable & I enjoy the smiling pictures because it adds more depth to your outfits. I agree with you on the quality of the fabric should be equal on the price but sometimes when you find an exquisite dress, top, etc you simply must not feel bad for paying the price! This is a lovely dress & I adore every thing about this outfit. Gorgeous! I love the dress! A staple! This is STUNNING! So glad you commented on my post this morning, because it led me to your blog! Love it. I love the stitching on it..and that color is great!! Amazing dress! Love the peach color!! You look amazing here, Merritt! Good find in Paris. I also love the shoes. You are an inspiration! What a feminine look! That peach color looks great on you. GORGEOUS. What a timeless find! That color is perfect. This dress is stunning! I can see why you had to buy it! It will be in your closet FOREVER! Love this peach color on you. The ruffle is so cute and that bag is to die for! Wow, that dress is absolutely stunning! It was definitely worth the splurge. The color is so soft and pretty, and that ruffle is dramatic and feminine. Love the new Chanel too…the perfect go-with-everything neutral. You look stunning, love that dress and your Chanel is precious. Stop it. That dress is stunning!